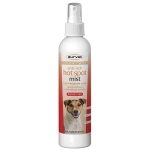 Anti-Itch Spray is veterinarian formulated specifically to provide gentle and immediate relief from minor skin pain and irritations caused by insect bites, abrasions, hot spots, cuts, and allergic dermatitis. Therapeutic. For treatment of ear odor and inflammation. Gentle. Daily use keeps ears clean and healthy. Soothing. Use daily to help reduce the inflammation caused by ear mite infestation. Healthful. Maintains healthy ears when used regularly. Tear Stain-Less Powder for dogs contains a special blend of herbs and antioxidants to help eliminate unsightly tearstains from the inside out. It also helps to eradicate staining due to saliva around the mouth and on hair coats. It does not contain antibiotics, alcohol, dyes or chemicals. Directions for Use: Give 1/4 teaspoon per 15 lbs body weight once daily up to a maximum of 1 teaspoon. Use daily until 30 days after stains disappear. Puppy-Vite Gel provides the right balance of vitamins, minerals, antioxidants and other essential nutrients to optimize the physical health of growing puppies up to 9 months of age. This liver flavor gel has a high caloric content (450 calories per 100 gm) and does not contain petroleum jelly or artificial colors. Brewers Yeast Flavored with Garlic is an excellent source of protein, trace minerals and B complex vitamins that helps maintain a healthy skin and coat. Directions for Use: One (1) chewable per 20lbs body weight. Nasty Habit™ chewables for dogs contain a special combination of ingredients that imparts a bitter taste to feces to stop dogs from consuming their own feces. Directions for Use: One (1) tablet twice daily per 20 lbs body weight. Note: If your pet consumes the feces of another dog or cat, give that animal Nasty Habits. Hip & Joint Plus Level 2 Liquid provides 750 mg of glucosamine, 200 mg of chondroitin, 750 mg MSM, 135 mg vitamin C, and 5 mg of hyaluronic acid to help maintain healthy canine joint function and connective tissue. Directions for Use: One-quarter (1/4) teaspoon per 20 lbs of body weight twice daily. 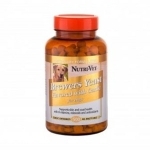 Senior-Vite chewables provide a balance of vitamins, minerals, antioxidants and other essential nutrients to optimize physical health and mental well-being in dogs over 9 years of age. Potent ingredients working together support cardiac and brain function and help combat degenerative mechanisms and oxidative stress to promote health and vitality in elderly canines. Directions for Use: One (1) chewable daily per 20 lbs of body weight. 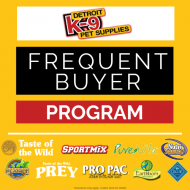 Multi-Vite chewables provide a wide spectrum of vitamins and minerals that complements a dog’s normal diet. Tasty liver flavor chewables make it easy to promote health and vitality. Directions for Use: One (1) tablet per 20 lbs of body weight daily. Puppy-Vite chewables contain vitamins and minerals to help ensure that puppies grow into healthy adults. Added antioxidants help neutralize free radicals formed during development, and taurine supports the growing puppy’s heart. Directions for Use: One (1) tablet per 10 lbs of body weight daily. Aspirin liver flavor chewables provide temporary relief of pain and inflammation associated with arthritis and joint problems in dogs over 50 lbs body weight. The liver flavor makes it easy to give and less upsetting to stomach. Aspirin liver flavor chewables provide temporary relief of pain and inflammation associated with arthritis and joint problems in dogs less than 50 lbs body weight. The liver flavor makes it easy to give and less upsetting to stomach. Directions for Use: 25 lbs and under – 1 tablet once daily. 26-50 lbs – 2 tablets once daily. Hip & Joint Level 1 liver flavor chewables provide 500 mg of glucosamine, 100 mg chondroitin and vitamin C and 10 mg MSM to help maintain healthy canine joint function and connective tissue. Dogs will love the taste and owners will love its ease of use. Directions for Use: One-half (1/2) chewable per 40 lbs of body weight twice daily. Allow four to six weeks for best results. Continue as needed. An innovative solution to house training issues! The Wee Wee On Target Trainer has fasteners where the pad is anchored in place- the pet cannot move it! Made of high impact plastic, the three sided, 'corralling' feature of the Wee Wee On Target Trainer prevents 'missing the pad'. Once the dog is trained to use the center of the pad, the side walls can be removed. The On Target Trainer fits all standard puppy Wee-Wee Pads (22” x 23”). One free pad included! Four Paws Nail Trimmers have been designed with stainless steel surgical blades which ensures sharp, clean cutting. Cleans & conditions in just one easy step! 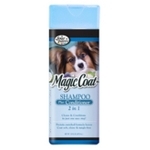 Protein enriched formula leaves coat soft, shiny & tangle free.